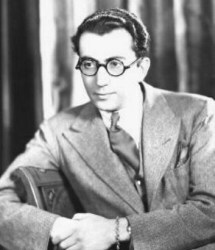 Rouben Mamoulian was an Armenian-American film and theater director, one of the first major directors to emerge with the advent of Talkies. He became known for his brilliant innovative camera work and resourceful use of sound. He made only 16 movies during his career but he directed two actors to Academy Award acting nominations - Fredric March in 'Dr. Jekyll and Mr. Hyde' in 1931 and Miriam Hopkins in 'Becky Sharp' in 1935, and in 1982 he was awarded the Lifetime Achievement Award from the Directors Guild of America. Rouben Mamoulian was born on October 8, 1897, in Tbilisi, Georgia, (at that time called Tiflis, and part of Imperial Russia) into a well to do, middle class and cultured family. His father was a director of a bank and his mother a theatrical actress and Mamoulian showed an interest in and aptitude for acting from an early age. Whilst studying law at the University of Moscow, he took acting lessons and began performing on stage at night. He studied at the Moscow Art Theater and worked with Eugene Vakhtangov, a disciple of Stanislavsky, before touring with the Russian Repertory Theater. His ambition took him to England and by his early twenties he was directing plays in London. After directing the hit London play "The Beating on the Door," in 1923 he was invited to America by Vladimir Rosing, the Russian operatic tenor and stage director, to teach at the Eastman School of Music in Rochester, New York where he became involved in teaching drama and opera. By 1925 he had become head of the School of Drama, but his ambition was for solo directing work and he left the school in 1926, and began his illustrious career as a stage and movie director. His first Broadway play was DuBose Heyward's 'Porgy', featuring an all-black cast.which opened in October, 1927 and he followed this by 'Marco Millions' by Eugene O'Neill in 1928 and with three further productions in the same year. For the rest of his career Mamoulian continued to return often to his first love, the theater, to direct a number of productions including 'A Farewell to Arms' in 1930, Gershwin's musical-opera, 'Porgy and Bess' in 1935, Rodgers and Hammerstein's 'Oklahoma!' in 1943 and 'Carousel' in 1945 and his own 'Arms and the Girl' in 1950. In addition he directed revivals of 'Oklahoma!' in 1951 and 1953. Mamoulian's movie career began as a result of the success of 'Porgy' when he was invited to Hollywood to join Paramount Pictures, initially as a dialogue coach to prepare the acting personnel for the oncoming Talkies. In 1929 he was given the chance to direct his first Hollywood movie, the backstage drama, 'Applause', one of the earliest talkies. Unlike many contemporary silent movie directors, Mamoulian positively embraced the arrival of sound and made many innovations and improvisations to use the new medium. He was one of the first to use the "blimp", a box which enclosed the camera to negate the sound it made when recording. He also, uniquely, on occasions, allowed the sound of the camera to be heard on the soundtrack, arguing, rightly, that the action of the movie would be so engrossing that it would not affect the audience's enjoyment. With 'Applause' Mamoulian introduced the use of 2 microphones, later mixing the sound to improve the quality. He also used more than one camera to increase the number of possible viewing angles. He continued to innovate with his following movies,using skilful lighting, location photography and clever tracking shots,in the gangster movie, 'City Streets' in 1931,and in the classic 'Dr Jekyll and Mr Hyde' in 1932, particularly with the transformation scenes in which Mamoulian devised a complicated layered makeup systems to achieve his effects. 'Love Me Tonight' in 1932 saw Mamoulian further refining his techniques and experimenting with the blending of picture and sound and in 1935 'Becky Sharp' was the first feature film to be made with the three-strip Technicolor process. 'Queen Christina', in 1933, starring Greta Garbo and John Gilbert, has come to be regarded as a cinematic classic. The famous final scene which tracks without interruption from long shot to close up of Garbo in the prow of the ship needed the invention of a new type of camera lens. Mamoulian further enhanced his reputation for top quality work in the early 1940's with two remakes of silent films 'The Mark of Zorro' in 1940 and 'Blood and Sand' the following year, both starring the heartthrob swashbuckler Tyrone Power and both box-office smashes. Mamoulian's output slowed considerably and he completed only three more films: the comedy 'Rings on Her Fingers' in 1942 and the musicals 'Summer Holiday' in 1948, based on Eugene O'Neill's "Ah, Wilderness!," and 'Silk Stockings' in 1957 with Fred Astaire, based on the 1939 film, 'Ninotchka'. Mamoulian was staunchly independent and had the unusual directorial distinction of being dismissed from three movies: 'Laura' in 1944, after disagreements with producer, Otto Preminger, 'Porgy and Bess' in 1959 again after disagreements with the producer, Sam Goldwyn, and from 'Cleopatra' in 1963, a production that was beset with financial problems, none of them of Mamoulian's making. He lived for the remainder of his life in Beverley Hills with his wife, artist Azadia Newman whom he married in 1945. He spent much time writing, and adapted several plays, wrote a book for children, called "Abigail" and in 1965 a drama textbook, "Hamlet Revised and Interpreted". He also developed an interest in art and made collage portraits of his wife out of leaves, flowers and shells. Rouben Mamoulian died in 1987 of natural causes in Woodland Hills, California. He was aged 90 years.